Blue Elephant Theatre’s Speak Out! Project gives disaffected students a means of exploring tough issues impacting on their lives, aiming to develop pupil’s aspirations, as Susan Elkin discovers. “I’ll be the grandmother and my name’s Sue”, says one girl. “And I’ll be Lia’s boyfriend, Tom. I’m 20 and I’m a mechanic,” declares another, while a third decides to be the main character’s ten-year-old younger sister. These girls are students at the City of London Academy in Bermondsey, South London. The drama group consists of about 12 girls, who look rather smart in their purple blazers. However, problems and issues are simmering not far below the surface. 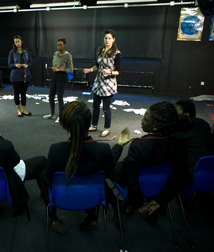 The girls all year 10 students aged 14 & 15, have been handpicked by their teachers from different classes as being the young women most likely to benefit from Blue Elephant Theatre’s ongoing and developing Speak Out! Project. Under the skilled and sensitive leadership of Jen Camillin, BET’s facilitator, the girls are sitting in a circle developing a story based around a made-up character named Lia. They decide that Lia doesn’t get on with her mother, doesn’t know her father, has had at least one abortion and is sexually promiscuous. Encouraged by Camillin to add positive ideas to make Lia a rounded character, they agree she is also caring, popular at school and quite intelligent. This is the fourth week of the eight week project. The girls still find it difficult to take turns to speak, and there is much talking over each other and the adults. However, Lucy Oragano, head of arts at CLA, says their listening skills have improved markedly since the first session. During that initial class, it emerged that what the girls hated most was being “labelled” or called names, with “slag” being the most detested term of abuse. So Camillin, calmly and assertively adept at focussing on the behaviour she wants rather than getting irritated by participants who don’t follow the rules, allowed the work to evolve around this name-calling issue. The fictional Lia typifies the sort of girls’ own lives and what they see going on around them. The project will culminate in an informal performance so the students can demonstrate what they’ve learnt and have achieved. Oragano would like this to be a presentation for an audience of the academy’s female staff, on the grounds it would help to establish some woman-to-woman solidarity in the school and do wonders for the students’ confidence- the core aim of the Speak Out! project. Based in Camberwell, South London, Blue Elephant Theatre has an extensive and imaginative education outreach programme. “Speak Out! is a forum that began at BET three years ago, funded by the Alan & Babette Sainsbury trust,” explains artistic Director Jasmine Cullingford . “The project has used forum theatre to tackle issues that affect young people, such as knife crime, bullying, confidence, anger and, most recently, the role of young men. We’ve usually toured with a 25-minute play followed by a workshop. Although the sessions are partly about developing self-control and respect for others, Oragano also makes a point of it being fun. She provides a little feast of chocolate brownies and cola drinks halfway through the session, for example. A special trip is planned for the group- to cost the students nothing- to Broadway Theatre, in Catford, a few days after my visit. They were going to see Present Theatre’s production of Stop Search, which raises issues around police powers and would probably have struck a chord with this group of urban young women. Taking part in the project means the girls are withdrawn from their other lessons for two consecutive 50-minute sessions- a total of more than an hour and a half a week. Oragano tactfully placates her colleagues by moving the time each week so the students do not repeatedly miss the same lesson and thereby fall behind with other work. Meanwhile, back at the school’s main drama teaching space- the girls are producing some pretty slick improvisation in which one or two characters and Lia argue, persuade, encourage and debate. Yet another imaginative way of using drama in education.